In a world of shifting economic realities, few financial equations last very long. In the marketplace, countless writers, analysts, and con artists clamor for the public ear. Whose voice can we trust? Which financial principles will stand the test of time? The Word on Finances sorts through the clamor of advice, plans, and ideas to bring us back to the final word we most need to hear: God's. Borrowing, bribery, planning, saving, taxes, and more-if the Bible mentions it, it's in this book. 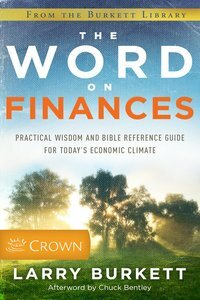 With Burkett's practical wisdom opening each topical selection, The Word on Finances is a go-to guide for spending money wisely and in a way that honors God. About "The Word on Finances"
Larry Burkett was the founder and president of Christian Financial Concepts, a non-profit organization dedicated to teaching Biblical principles of money management. He was the author of over seventy books, including The Coming Economic Earthquake, Your Finances in Changing Times, The Financial Planning Workbook, Investing for the Future, Financial Parenting, and Business by the Book, with totals in excess of 11 million. Larry's ministry also included a monthly Christian newsletter and four worldwide radio broadcasts, Money Matters, How to Manage Your Money, Money Watch, and A Money Minute, Larry died in 2003.